In the just concluded Brazil 2014 FIFA World Cup, Microsoft Windows Phone Virtual Assistant 'Cortana' gained popularity because of it being able to predict some of the World Cup matches successfully, it even predicted Germany as the winner in the World Cup Final. Apart from Cortana, we also have some other Virtual Assistants like Ok Google (Android), Siri (Apple) and there is no doubt that these Personal Assistants have been helping us with our day-to-day activities by helping us to do some searches, scheduling appointments and even navigating from one place to another. But have you ever thought of having a real Personal Assistant on your Smartphone ? Yeah, it's possible, but how ? There is a new Smartphone Mobile Assistant Application in town which get your questions answered by an actual & real person. This Application is named - "Ask Ooloo". 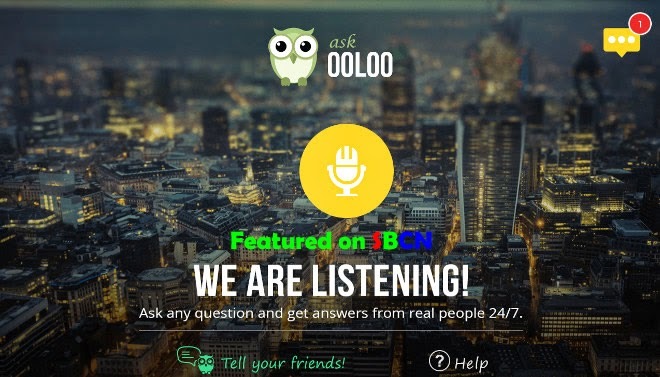 Ask Ooloo is a people-powered-digital-assistant (PPDA) that will get you answers to your queries with some personal flair and localized flavor. Take for example, you’re new in a city and you're in need of some info about the best restaurants, supermarkets, bars etc, someone from that same city will be able to tell you which spots are worth checking out. And even if it's a general question, you’ll get a response some minutes later accompanied with a personal touch. So don't you think this mobile assistant is unique ? Yes, I think it is. That's probably the main reason why it is not free, you'll just have to pay a token for Ask Ooloo. Although, the App is sometimes tagged a price, so it's better to download the App as soon as possible cuz it is free right now before it gets a price tag again. For now, Ask Ooloo is available for Android and iOS users, so the download links below will help you download & install Ask Ooloo on your Android and iOS devices. What do you think about this mobile assistant ? Do you still prefer your Cortana, Siri or Google Now to it ? Kindly share your opinion & contribution with us, you can also let us know about some other Smartphone Virtual Mobile Assistants which you know of, using the comment box. Kindly share this post with others using the share buttons below. Have a wonderful week !! !